If you have worked in an industry or government agency that is required to keep a lot of paper work. You know how difficult it is some times to find a folder and how often they are misfiled. 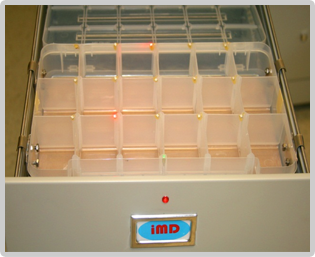 iMicroData is introducing a new system which uses a systems of RFID tags and integrated circuits to enable users to locate folders quickly by title or keyword. The standard filing cabinet is modified electronically. The rails along the inside of the file cabinets are used to conduct both power and information. Each folder will have a conductive contact installed on the tab that sits on the rail and an integrated circuits and a led light installed along the top. There is a motherboard installed in the cabinet, which generates the system address of a given folder. When you want to search for a folder you go to the application on a computer, input in the keyword or title for folder and the file cabinet where that folder is will light up. Once you open up the cabinet up the correct folder will light up.